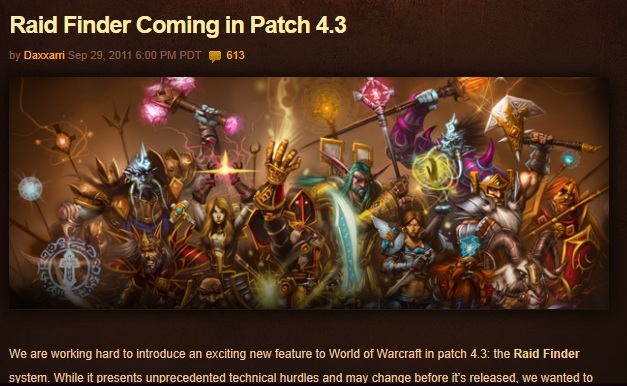 Becoming Less and Less Social #WoW #MMORPG – Nomadic Gamers, eh! Even though I’ve played World of Warcraft since release, I’ve never ever found myself within a ‘community’ on any of the servers I’ve played on (a small handful of them now) and it looks like with the latest patch, I won’t ever have to. Blizzard is introducing their first raid finder which will work much the same as the dungeon finder, although (to start) it’s only for a very specific raid. Notice that I said ‘to start’. I’m going to predict that given some time this will extend to other raids, and I bet it will be quite popular. In World of Warcraft I can level from 1-85 without ever speaking to another player – while doing group content the entire time (via the LFDungeon tool). I can be teamed up with hundreds of strangers from multiple servers, and never learn a thing about them (although that doesn’t prevent players from going on about their drug habits or spouting out rude comments to trade chat). One of the main reasons I ever play a game is for the social aspect which is why I typically ‘quit’ WoW after a month or two – because there’s simply no social aspect. Is this what people these days want in their MMOs? I can’t help but wonder. With Rift adding their LFDungeon tool and then solo / duo dungeons, and EQ2 following close behind adding their LFDungeon tool, the days of having to actually go out and speak with others on your server in order to find a group are slowly dwindling. Then again when I look at public channels I wonder if these are the sort of people I even want to get to know to begin with. How do you go about finding the gems that must reside in your game of choice? I was trying to Trackback to the post I just made in response to this over on my own blog, but apparently Blogger doesn’t do trackbacks. The gist is that the old ways still work, I think. I’m very much looking forward to the Dungeon Finder coming to EQ2, although as PKDude points out, we’ve actually had one for a long time and no-one uses it. Smokejumper is adamant that the new version won’t be cross-server, so I am guessing unless that changes no-one will use this one either. The single-server concept lasted about two week in Rift. Lack of a community feeling is one of the things that has kept me from really enjoying WoW. So used to the public chat channels on EQ2, getting to know folks from Crafting and Homeshow, chatting with the elite (and often egotistical, but still interesting) in 80-89, watching the trolls in 1-9, and even joining in the various roleplay channels. Remove the few bad apples, and there’s actually a thriving community of folks there who are looking for groups, seeking help, offering assistance, having fun, etc. My feelings towards WoW have been similar. When I first started playing shortly after release, a number of my friends from school played. I played mostly because I enjoyed spending time with them outside of school and WoW provided a good outlet to do so. When they stopped playing though, I found myself unable to connect with anyone else in the game. There was almost no need to. I quickly grew bored and stopped playing. The game that captured my attention the longest is Final Fantasy XI, which many consider to be a terrible stain on both the Final Fantasy name and the MMO genre, alike. I agree that just about every component of the game left something to be desired, but what the game did do was force you to interact with other players. Being forced to do so could be unbelievably frustrating at times, but it allowed me to make lasting connections with friends whom I still keep in touch with today, years later. I enjoyed suffering through FFXI’s difficult grinds and confusing dungeons because I was doing so with people that I really enjoyed playing with. I’ve yet to find another MMO that has similarly facilitated such strong connections. But I can say that if ever I find myself hooked on another one, it will be not only because of immersive gameplay, but because of the quality of people who spend their time immersed. EQ2’s long had an automatic group finder. It’s actually a lovely tool. Shame no one uses it — by the time it was introduced everyone was so used to spamming in the server channels that it simply never caught on. And I’ll admit that until I saw your post here, I’d quite forgotten it existed as well, so I’m just as guilty of not using it either.